There’s a very real problem with the developer book market: many programming books become obsolete almost as soon as they’re published. SourceBeat’s "Live" book concept is an intriguing one, and is designed to answer this problem. SourceBeat is kind of like the software subscription model except for books. Their books (eBooks really) are in secure PDF format, and cost $29.95 for a year’s subscription. For your squids you get (ir)regular updates during the year, keeping the book up-to-date. So a major consideration with the book subscription model is that you must enjoy reading books on your PC screen or your PDA. (Having said that, you can also buy the book in traditional "pulped-tree" format - but the benefits of the e-version far outweigh the palpable weightiness of the printed version). 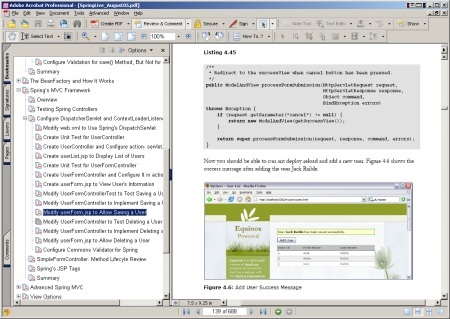 As the title suggests, Matt Raible’s Spring Live (SourceBeat, 2005) gives the "Live" treatment to the Spring framework. The book is aimed at programmers that are familiar with Java but have never used Spring. The book opens with a useful quick start tutorial. It walks you through the basics of creating a simple application, which then becomes the central example built upon throughout the book. The example app is actually based on Matt’s open-source application Equinox, which he was inspired to create whilst writing Spring Live. Equinox is a "starter" web app, useful for getting a jumpstart when embarking on a new web project. It sits somewhere between the (tiny, not especially robust) struts-blank and webapp-minimal applications that ship with Struts and Spring respectively, and the much heavier starter app, AppFuse. It might sound as if the book is biased towards Struts for its presentation tier, but it also pays attention to other front-ends such as JSP, Velocity and FreeMarker. The chapter on persistence strategies provides some insightful advice for choosing which of the many persistence options to go for (Hibernate, iBATIS, JDBC or JDO). There’s also a good chapter on applying Test Driven Development (TDD) with Spring. A nice benefit of the book being a PDF is that its pages can contain hyperlinks and aren’t limited to black & white (as you can see in the screenshot). Given this, I’m surprised that the book doesn’t make more extensive use of color, e.g. for annotating those black & grey code listings. Perhaps we’ll see more use of color in future SourceBeat titles - or even in future versions of Spring Live. Which is, of course, the beauty of the SourceBeat approach: you pays your money, you gets your annual subscription with updates. So, overall? It’s well written with clear examples, and provides a nice, broad introduction to Spring. Recommended. Sample chapter available here (PDF).